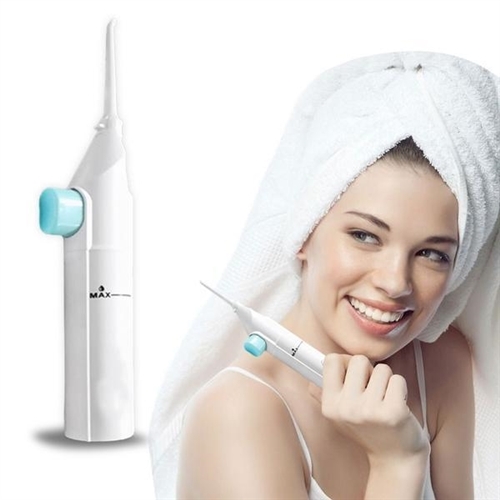 Power Aqua Floss Water Flosser - No Batteries or Cords! The dental water jet flosser that uses water and air to power away plaque causing debris between your teeth. Power Water Aqua Floss is powerful and effective, leaving your mouth feeling fresh and clean. Pain free- gentle enough for kids! Power Water Floss is a powerful oral flosser to keep your teeth and gums clean. This dental water flosser is not powered by batteries or electricity. It uses air and water to gently and effectively clean between your teeth. Power Water Aqua Floss will blast away plaque causing debris. Perfect for everyone in the family. This Aqua Floss is great for kids and those with braces. Simply put water in the reservoir and your ready to floss with water. You can even put your mouthwash in Power Water Aqua Floss to get in between your teeth.